The first chapter of Linda McGurk's book, "There's No Such Thing as Bad Weather," outlines perfectly the scene in many American outdoor spaces. McGurk and her girls, then 4 and 7, were exploring their small community park on an unscheduled "snow day," making snow angels and tracks, giggling all the way, when daughter Maya noticed something amiss. "Mommy, where are all the other kids? Why aren't they at the park?" McGurk, who was born and raised in Sweden and now lives in Indiana, found the moment to be pivotal. Truth be told, kids in the United States are spending less time playing outdoors, falling far short of the free-ranging childhoods many of us, especially those who grew up in Alaska, were able to experience. Last month I wrote about the value of recess and opportunities for free play within a child's school day and received a stream of messages from parents wondering how they can foster a love of outside time with their friends and family and support a school's effort to balance classroom learning with outdoor education. Families today lead busy lives. Schedules must factor in work, school and sports, never mind dinner and homework. All this rushing around has created what McGurk calls a "perfect storm" for letting outdoor play take a backseat on a family's priority list. "I think there have been a lot of changes in the U.S. over the past three or four decades that have created the situation we're seeing today," she said in an email. "Obviously, the rise of electronic devices and digital media has had a huge impact, and how to balance screen time with "green time" is a major challenge for parents." It's not just here in the United States, either. A recent study conducted in Great Britain estimated that children spend a mere 16 minutes a day outdoors during young childhood, and a dismal 13 minutes in the tween years. Teenagers spend even less than that — 10 minutes a day, weekends included. A typical school day adds yet another barrier. In my last column I quoted Dr. Mark Stock, deputy superintendent of the Anchorage School District. Stock agreed that outdoor time for students is indeed important, but the stakes are higher than ever for student achievement. "We want to assure parents that we are using the time when their children are in school to provide the best education possible," he said, replying to my query about the tenuous balance between play and learning times. Required tests and mandated standards mean every minute of every school day is full, including the once-sacred recess periods, which in the Anchorage School District have shrunk to an average of 20 minutes per day of outside time. Raising healthy, happy kids means creating a system within your family that works for everyone. And, says McGurk, an early start. "Had I done it over again, I would have tried harder when my kids were really young to find at least a few like-minded people and started some sort of nature play group or other regular family get-together outdoors," she said. Finding a tribe of people that encourages and welcomes opportunities to play outdoors is important, whether it's a group of neighborhood kids in a back yard, or a more structured meet-up at a park or trail. For better or worse, social media can be a tool for creating a hub where ideas can be shared, activities planned and connections made. How does a busy family start integrating more outdoor time into an already-packed day? With baby steps. Below are a few ideas for Alaskans to take advantage of our accessible wilderness, any time of year. McGurk was raised smack in the middle of what Scandinavians call "friluftsliv," best summed up as an "open-air life." It can be anything — hiking, berry-picking, walking the dog — but the key is non-competitive, low-expectation outcomes for anything but a simple joy of being in nature. Many parents (and schools) believe activities must be structured; that is, organized, with clear boundaries for beginning, middle and end. Often these activities are competitive and achievement-based. Why not make sure your family has at least 30 minutes a day of simple, pleasurable time outside? Take an after-dinner walk (we're pushing 12 hours of daylight, so use it); climb a tree in your backyard; dig a cave in that melting snow berm. Breathe deep, look around for signs of spring and get ready to smile a lot more. Alaskans are fortunate to have an abundance of public lands, visitor centers and information platforms that provide opportunities to learn about and enjoy the miles of trails and acres of space available for recreation. The Alaska Public Lands Information Centers are a collection of four outlets in Anchorage, Fairbanks, Tok and Ketchikan where visitors can find a campground, a trail or ask questions. Additionally, places like Campbell Creek Science Center in Anchorage offer a wide variety of activities, be it a fireside chat or parent-child playtime. Fairbanks families can utilize the wide-open spaces and cozy farmhouse at Creamer's Field Migratory Waterfowl Refuge for kid-centered classes, walks and activities. In Homer, the Center for Alaskan Coastal Studies is gearing up for a busy spring and summer with camps, guided walks and hikes, and their popular Creatures of the Dock Tour in the local boat harbor. Growing kids can be hard to outfit in warm, weatherproof gear that withstands puddle-jumping, biking and skiing. Create a hand-me-down circle of friends, passing down items that withstand the test of time. Browse second-hand and consignment stores for everything from base layers to boots. When my sons were younger, I purchased waterproof rain gear that served a dual purpose of shedding water and snow and saving snow pants from destruction. 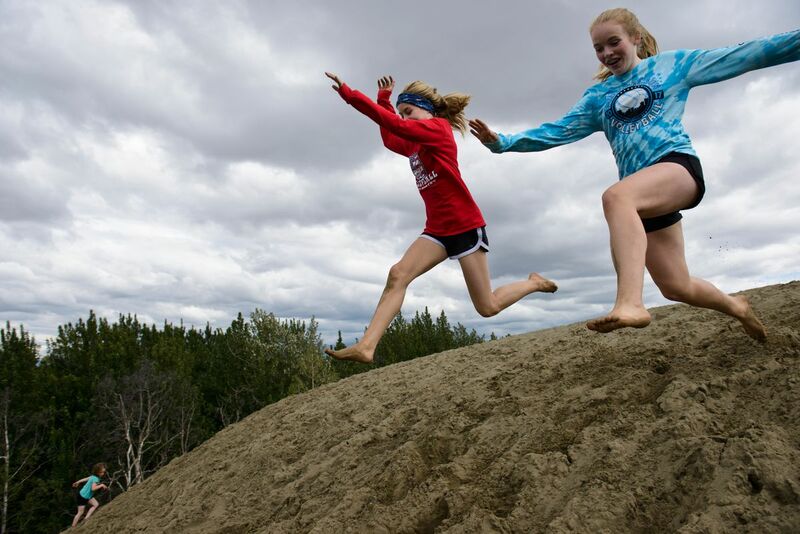 Whether you and your friends gather weekly for a hike or schedule longer trips to a campground or public-use cabin, Alaska has a plethora of options for enjoying the outdoors with other families. New to Alaska or parenting, and need to build your outside-confidence level in wild places? Join an outdoor-themed group committed to showing their youngsters the value of outside time. Those with children under 4 may enjoy Hike it Baby or Anchorage-MatSu Tiny Trekkers. Last Child in the Woods, by Richard Louv. Considered the bible of outdoor play, this was the first book to identify research leading to the conclusion that time spent in nature is essential for healthy childhood development and for the physical and emotional health of both kids and grownups. There's No Such Thing as Bad Weather, by Linda Akeson McGurk. Tying together the Scandinavian traditions of embracing outdoor time and the raising of independent kids, McGurk shares helpful tips and her own experiences raising two daughters in the U.S. and Sweden. She is blunt, thorough and unabashedly pro-nature. Erin Kirkland is author of the Alaska On the Go guidebook series and publisher of AKontheGO.com, a website dedicated to family travel and outdoor recreation.